Nocelle is a little village 450 metres above sea level overlooking Positano, Li galli Island, Capri, I Faraglioni and Punta Campanella. Nocelle is a little village 450 metres above sea level overlooking Positano, Li galli Island, Capri, I Faraglioni and Punta Campanella. Today Nocelle is still a quiet and rural village that enchants everybody who visits it. The Bacio del Sole B&B is surrounded by scented lemon groves and vineyards. Its view of Positano is breathtaking. Bacio del Sole B&B is the perfect place for people who love the mountains and the sea, it is only 15 minutes by car from the Positano Beach and at the beginning of the famous Sentiero degli Dei a unique path that winds for 11 Km through the spectacular Amalfi Coast peaks. 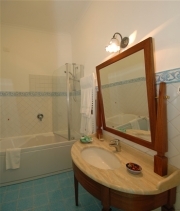 Recently renovated the Bacio del Sole B&B is in perfect Amalfi Coast style. All the rooms have a private terrace and garden with breathtaking sea view, sun bed, kitchen, bath with Jacuzzi and shower, satellite TV, safe, air conditioning and telephone. A great breakfast will be served in a room, one could have breakfast in complete privacy on the wonderful terrace. Private terrace and garden with breathtaking sea view, sun bed, kitchen, bath with Jacuzzi and shower, satellite TV, safe, air conditioning, phon, Beauty kit, WiFi and telephone. Take the A1 motorway to Naples, after Caserta take the A3 Naples-Salerno motorway and exit at Castellammare. Take the ss.145 state highway towards Sorrento and then the ss.163 towards Positano. In Positano at the first crossroad turn left towards MONTEPERTUSO NOCELLE. After 4 km. the road will end at a big parking lot. It a 10 minute walk from there to us.